Instructor Kris Prosser goes over victim assessment/triage procedures as part of the FASTER training. Lead instructor Kris Prosser demonstrates how to assess and treat major hemorrhages on various parts of the body. 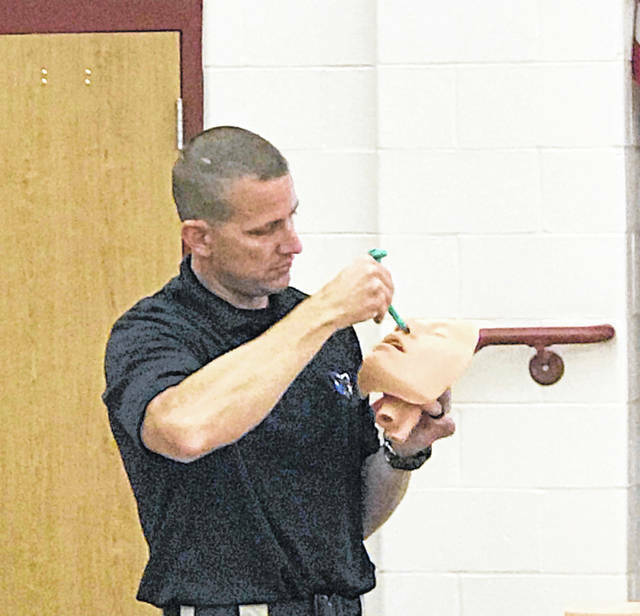 Kris Prosser shows how to insert a nasopharyngeal airway tube to provide a clear airway for a victim. Angela Armstrong from the FASTER Foundation and Kris Prosser, the lead instructor, spent time teaching Eastern Local staff as part of a waiver day. 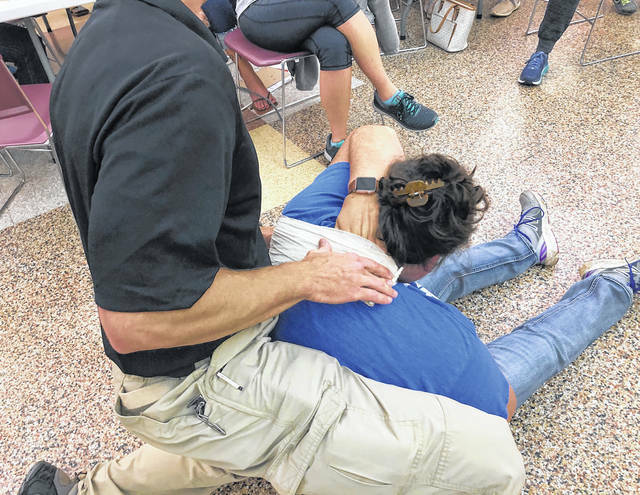 REEDSVILLE — More than two dozen Eastern Local staff members and administrators took part in a potentially life-saving training during a recent waiver day. 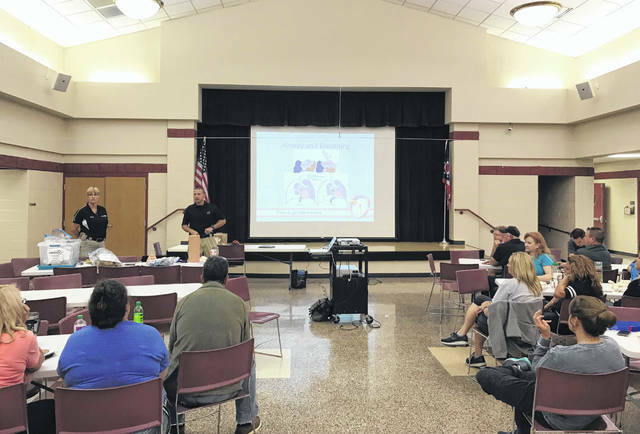 Eastern Middle School Principal Bill Francis explained that staff from all of the district’s buildings, administrators, bus drivers, cooks, aides and the county’s four school resource officers took part in the training presented by the FASTER program. FASTER stands for Faculty/Administrator Safety Training & Emergency Response. According to the program’s website, FASTER was created by concerned parents, law enforcement, and nationally-recognized safety and medical experts. FASTER is a groundbreaking, nonprofit program that gives educators practical violence response training. The training held at Eastern was a portion of the full three-day training held by the FASTER Foundation which Francis has completed. Francis said the techniques learned through the training have saved two lives in Ohio already. FASTER Saves Lives follows the MARCH assessment with nine steps in an emergency situation, noted Francis. Those include: security, level of consciousness, major hemorrhage, airway, respirations, circulation, head injury/hypothermia, reassess and vitals. Among the items covered in the training were how to assess injuries, wounds in different areas, how to remain calm and get others involved to help. 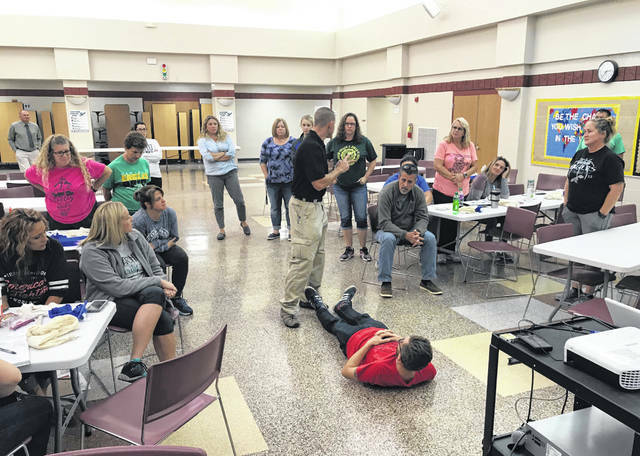 The FASTER training is an extension of the trainings which the district has already completed, including ALICE, as they work to prepare for potential emergency situations. The district was also awarded a grant for 12 classroom trauma kits which have supplies which could be used in accordance with the FASTER program. The kits are valued at $80 each. In addition, Holzer Health System donated two trauma cubes and 14 classroom trauma kits to the district. Additional trainings are being planned for future waiver days. 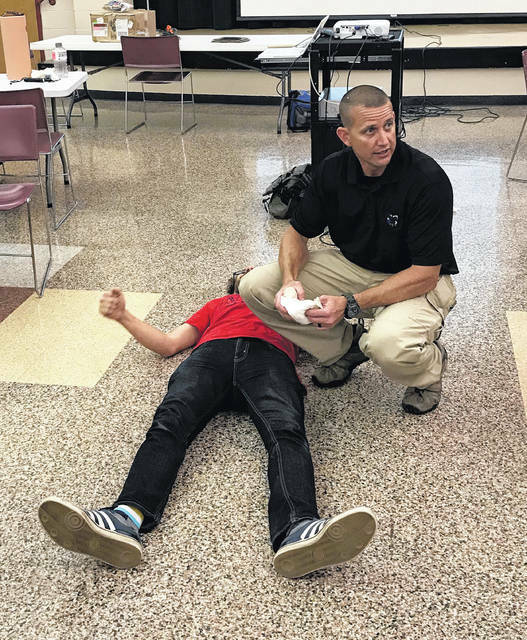 https://www.mydailysentinel.com/wp-content/uploads/sites/14/2018/10/web1_10.17-Faster-1_ne2018101613634102.jpgInstructor Kris Prosser goes over victim assessment/triage procedures as part of the FASTER training. https://www.mydailysentinel.com/wp-content/uploads/sites/14/2018/10/web1_10.17-Faster-2_ne2018101613648395.jpgLead instructor Kris Prosser demonstrates how to assess and treat major hemorrhages on various parts of the body. https://www.mydailysentinel.com/wp-content/uploads/sites/14/2018/10/web1_10.17-Faster-3_ne201810161379212.jpgKris Prosser shows how to insert a nasopharyngeal airway tube to provide a clear airway for a victim. https://www.mydailysentinel.com/wp-content/uploads/sites/14/2018/10/web1_10.17-Faster-4_ne2018101613715869.jpgLead instructor Kris Prosser demonstrates how to assess and treat major hemorrhages on various parts of the body. https://www.mydailysentinel.com/wp-content/uploads/sites/14/2018/10/web1_10.17-Faster-5_ne2018101613736243.jpgAngela Armstrong from the FASTER Foundation and Kris Prosser, the lead instructor, spent time teaching Eastern Local staff as part of a waiver day.